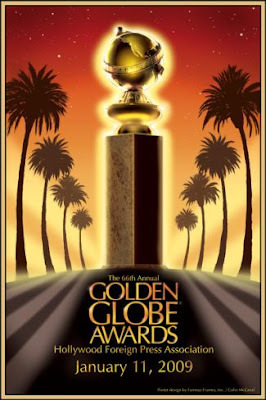 The Hollywood Foreign Press Association has announced this morning the nominees for the 2011 Golden Globe Awards. The Golden Globes are an entertainment mash up of television and film, a banquet with booze flowing and usually more fun to watch (for drunken mishaps) than the film-exclusive Academy Awards. As always, Comedy/Musical and Drama are separate categories. This allows for a few colorful surprise nominations such as the critically panned pop musical Burlesque, the underrated comic-book adaptation Red competing along side Tim Burton's massive money making feminist re-envisioning/quasi-sequel Alice in Wonderland and the CLEAR winner, the brilliant family portrait The Kids Are All Right in the Comedy/Musical category. As expected in the Drama category, the Black Swan, The Social Network and The King's Speech fight it out with The Fighter and the long shot sci-fi action flick Inception. So diverse are this year's films in content you get to see strange competitors like Inception composer Hans Zimmer up against Nine Inch Nails front man Trent Reznor (with Atticus Ross) for David Fincher's Facebook biopic The Social Network. Also this year I'm pretty certain we'll see Chris Colfer take home a Golden Globe for his performance as Kurt Hummel on Fox's undeniable megahit musical romp Glee. Read the full list of nominees after the jump. I loved "The Kids Are All Right" and I'm so glad they recognized both Annette Benning and Juilianne Moore. Both are deserving, but Moore's performance was more of a standout to me. I will be shocked if it doesn't win. I feel the same way- her speech about marriage being hard was Oscar worthy right then and there for me.